So this is a bit later in the day than I’d intended, but I spent a good portion of the weekend playing catch-up with my classes since my textbooks finally arrived. I’m sleep deprived and mildly incoherent. Fun times! Welcome to the conclusion of the Foundation and Empire Groupread. Last week’s discussion can be found here. This post will contain spoilers. I’ll be posting a spoiler-free review sometime later in the week for anyone who hasn’t read the book. 1. While it didn’t break new ground, Asimov did have a female character who played a major role in this second half of the book. What are your thoughts on how Asimov portrayed Bayta? I’m a big fan of Bayta. She’s intelligent, determined, and knows when shooting someone is the correct course of action. 2. Now that you know the Mule’s identity, were you surprised or had you figured it out along the way? If you did figure it out, how did that affect your reading of the book? When I was reading this section, I guessed the Mule’s identity early on. His absence was so conspicuous that I guessed that he had to be the clown, especially after a certain musical performance. However, I had thought that Bayta shooting Mis at first was a manifestation of the fact that the Mule had taken over her emotions. I hadn’t guessed that she would have been the only one to escape. 3. In previous posts we discussed the role individuals seemed to have in the unfolding of Seldon’s plan. How do you feel about the issue now that we’ve seen an individual derail Seldon’s plans? I almost want to say that they deserved it. Let’s face it, the Foundation guys were a bit obnoxious in this section, and there was way too much stagnation and squabbling going on. So it was the Mule instead of the Traders… and I was okay with that. I think that it’s a neat twist to show how an outside force can change Seldon’s plan. I don’t think that the fact that the Mule was an individual was important; what was important was that he could change the rules of social/group behavior, which is what allowed him to take over in the first place. You know… I like the Mule. He’s mostly harmless. He doesn’t seem to be hurting anyone, and his conquest was largely bloodless. Maybe it wouldn’t be so bad if he did succeed, if he could learn when to stop with his emotional manipulation and let people live their own lives. We’d see a new empire, surprisingly free of obstacles and bloodshed. I’d be upset about a dynasty though; that could go the wrong way very quickly. I felt bad for the Mule, because it must have been lonely knowing that nobody except for Bayta liked him for who he was. I’m glad he got away in the end. I didn’t want to see Bayta have to kill someone whom she’d befriended. It would feel like a betrayal. 5. How do you feel this story compared to all the other stories that have made up the two Foundation novels we’ve read? This was my favorite section thus far. It was so interesting! I enjoyed having a likable villain who was able to display the limitations of Seldon’s plan. 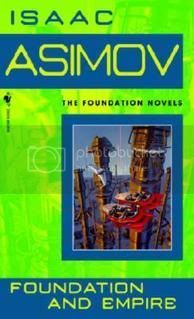 I’m also glad that Asimov is finally starting to give us more time with the characters; while I like short stories, I think that the longer ones work a bit better at this point in the Foundation’s history. I’m incredibly curious about the Second Foundation. I liked hearing Mis’s theories about it, and I want to know where it’s hidden and what it’s like. I also thought it was neat to see the ruins of Trantor; up until this point, the Empire was stagnating but still hanging on. Now we’re finally seeing Seldon’s predictions in full motion at the very same time as his predictions for the Foundation were disturbed by an outside force. Feel free to join us for the groupread of “Second Foundation,” which we will be starting next week! “knows when shooting someone is the correct course of action”–this really made me giggle. I also liked the Mule and was trying to see what was so wrong with his control. You know, besides the mind control thing. But as evil dictators go, he wasn’t bad at all. I’m waiting for the Asimov twist. It’s part of the same reason why I have a hard time with some dystopias… I don’t think that life under the Mule would be that bad; in fact, it’s probably better than under the Foundation’s leadership at the time. The foundation leaders were horrible and I was anxious for their demise, or replacement, or something. I think I was more disturbed by The Mule’s behavior than you were, but I also did feel sorry for him, and your comments made me realize that his tactics are somewhat similar to Salvor Hardin’s in the lack of violence. I kind of want to compare/contrast their modes of power now. This was my favorite part so far too. I’m glad you had something good to read in the midst of textbook reading! Oooo…interesting connection with Salvor Hardin. I’ll have to ponder that! It is an interesting connection. I’m intrigued! At this point in the story you can’t help feel a bit smug with the fall of the Foundation, considering they were ignoring Seldon when he had appeared twice before and nobody was there to hear what he had to say. Yup. I was surprised to see that; I had wondered in the last section whether or not there would be more Seldon appearances. It was nice to have that moment where we weren’t quite sure why Bayta shot Ebling Mis. It had that good “oh no!” feel to it. I found it interesting that the Mule’s own self-centeredness, even if his motives were good, were what undid his ability to discover the location of the Second Foundation. The Foundation was becoming a victim of its own corruption, to be sure. If you look back Seldon never really says that the Foundation is to be some sort of utopian society. He knew enough not to predict that. In fact he had predicted a civil war of sorts which was undone by the Mule’s intervention. The main purpose of his plan was to preserve the knowledge of society and see the rapid rebuilding of a new Galactic Empire. So it makes sense that some of the same issues with the Empire would find themselves continuing in the Foundation. I’m not sure any of us would really want to see an end to bloodshed and violence brought about by giving up our individual freedoms and instead being mind-controlled zombies, which is essentially what folks like Pritcher became. It is interesting how future stories built upon this idea. I am thinking in particular of the many Star Trek episodes that deal with beings of higher intelligence wanting to interfere with humanity because of our violent natures. It never goes over well, lol! I too thought it was neat to see the ruins of Trantor, and I like how they still preserved the library. Very cool! Seeing the library preserved reminded me a bit of “The Time Machine.” It was cool that it was one of the things that wasn’t torn down for scrap metal. One of the interesting things about the Mule’s form of mind control was that on a macro level, he didn’t seem to try to micromanage people’s lives. It was more like “work for me, and then go do whatever.” He was just such an interesting character… it’ll be interesting to see what happens next to the Foundation now that Seldon’s plan has been thrown off course. I think that’s one of the things that Asimov’s good at… he’s created heroes that we can hate and villains that we can sympathize with. Good and evil aren’t clearcut things, and everything’s a bit more nebulous. I’m liking that aspect of the story a lot, and I’m curious as to how the second book will be.